A Dinka man setting an animal trap (dang) into the earth on a game path [poor image]. The Powell-Cotton's collected this trap, perhaps from the individual in this image, on the 3rd May 1933, and donated it to the Pitt Rivers Museum. It is likely that this print is a still taken from the cine-film made by Powell-Cotton during this expedition. Notes on print reverse Ms pencil - "No 2. Dinka Animal Trap. Fixing D. firmly in the ground. Fanam weir, Sudan 1933"
PRM Accession Records - [p. 248] 1934 [insert] 8 [end insert] - MAJOR P. H. G. POWELL-COTTON , Quex Park, Birchington, E. Kent. Specimens collected by himself & Mrs Cotton, during hunting trips, 1933, viz: - From the DINKA tribe, FANAMWEIR & KORNUK, WHITE NILE [...] [insert] 11 [end insert] - Dang , trap for antelopes etc, a very powerful bow with torsion-string of hide, stick, noose of hide, etc. ib[idem] [FANAMWEIR] (2224). Other Information - Fanamweir is now located in the administrative district of Warab in the Southern Sudan. 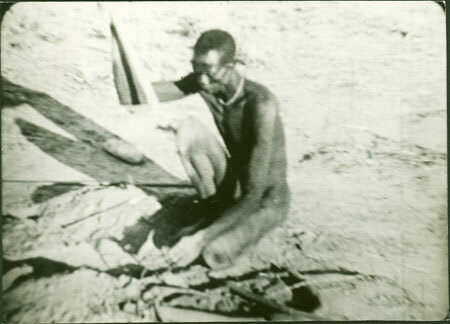 Powell-Cotton made ethnographic films during his 1932-3 shooting expedition to southern Sudan; footage included a Dinka hunter setting a trap: "In a game track a Dinka hunter laid a noose and set its weighty spring-trap, formed like a bow strung with twisted hide" (see the description in Mrs Powell Cotton, "Village Handicrafts in the Sudan", Man 34 (112), pp 90-91). Dang (plural deng) is a Dinka word meaning bow (D.G. Beltrame 1880, Grammatica e Vocabolario della lingua Denka, p. 190 gives definition as 'arco, schioppo, lancia); Nebel defines the term dhang, pl. dhèng, as ‘bow, rifle’ (Nebel 1979, Dinka-English Dictionary, p. 27). See also Schweinfurth 1873, The Heart of Africa, where dang is used to described a bow-shaped type of parry shield. The Nuer also use the word to describe a type of staff with curling ends, which may be related to this form [RTS 8/11/2004]. The PRM related documents contains details of a cine film 'some tribes of the Southern Sudan', taken by Powell-Cotton during this 1933 expedition, copies of which are now in the National Film and Television Archive and the Powell-Cotton Museum in Kent [RTS 14/3/2005]. Morton, Chris. "Dinka man with animal trap" Southern Sudan Project (in development). 03 Jan. 2006. Pitt Rivers Museum. <http://southernsudan.prm.ox.ac.uk/details/1998.207.3.2/>.